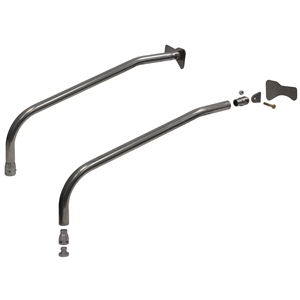 Exact-Fit Front Struts for '70-81 Camaro, 4130 - Includes: Firewall mount plate and tab, 1-5/8" x .083" 4130 strut tube, and Gemini connector. Strut tube is removable after weld-in connector and firewall mount installation. - Acceptance by any sanctioning body not guaranteed. - Will not clear OEM-size power brake booster.